Aaarg! I am still trying to get the hang of this blogging thing (geez I sound like an old lady sometimes, ha ha ha)... I wrote the LONGEST post last week, complete with lovely photos and hyperlinks galore when the entire thing crashed on me and deleted all my hard work! Grrr.... So I had to give my temper some time to cool off before trying to write another post! Back in November on Remembrance Day long weekend, N and I drove down to the coast to visit some friends in Squamish. We also took a day trip into Vancouver where I experienced my sewing / crafty nirvana... Dressew!!! I read the reviews online so I sort of knew what to expect; many cheap fabrics, lots of costume stuff, and SOOOO much notions (which are all in the basement). Most of the online reviews said the staff was super unfriendly, but I didn't find that at all! The lady who worked in the clearance section of the basement was HILARIOUS and showed me some ridiculous upholstery fabric that had Jesus images all over it - perfect to reupholster your furniture with (lol)! N and I found meter parking nearby so the clock was literally ticking. I didn't have much time (only 30 minutes) luckily I had made a list beforehand complete with fabric swatches and fabric amount requirements for my various upcoming projects. I ended up mostly buying some notions, but did find some fab chocolate brown ultra-suede fabric that I plan to use to (finally!) make a bed-skirt for our king-sized bed. I ended up finding lilac bias-tape and a lilac zipper with which I was able to complete my entry project for Burdastyle's Bernina 3 Series contest (obviously I didn't win, nor did I expect to considering the amazing talent that is out there!) but it was fun and a good learning experience. I used Burdatyle's Marie skirt pattern in a grey wool fabric I found at a thrift store, and made the top part of the dress from a combination of a few different bodice patterns. The lilac cotton fabric was also a thrift store score for just a few dollars. I wanted to make a cool, layered collar but unfortunately didn't have enough fabric. I was inspired by the Blakely dress by J. 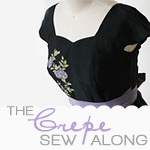 Crew, and added a ruffle around the neckline. I love the result! N snapped this photo of me just after the first snowfall here in the Southern Interior, and it's actually just water in my martini glass (it's also like 10am in the pic, lol). We also went with a group of friends to see Harry Potter and the Deathly Hallows one Tightwad Tuesday back in mid-November. (I am not sure if this is just a Canadian thing, but most theatres offer reduced admission prices on Tuesday evenings across Canada...) I am a HUGE fan of the novels, and therefore a big fan of the films as well. 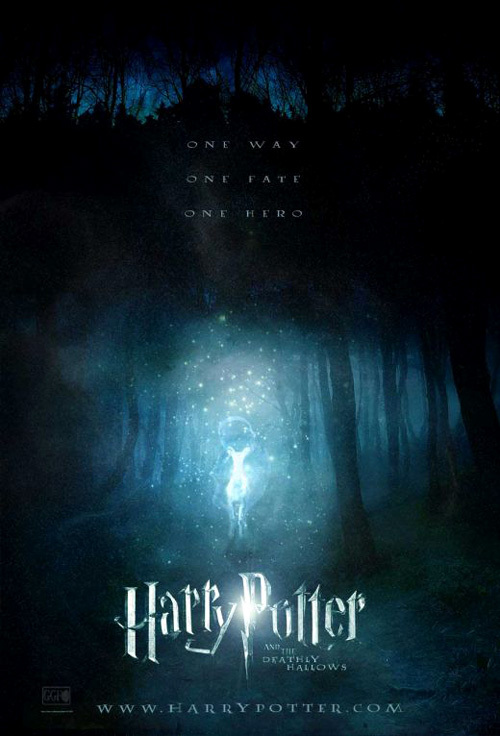 I was very pleased with the film version of Deathly Hallows, mostly because they are presenting the story in two films. I've heard lots of people complaining and saying "it's just a money grab to make two parts". Obviously these folks have not read the books, because if they had, they would know that there really isn't anything that can be left out. Otherwise the story wouldn't make sense at all! This is definitely a dark film (obviously, considering the storyline) but they did an amazing job of injecting humour into the film via the Weasley twins, Ron, and Luna. Bravo! I am back to work part-time now (which is nice), and I'm using my spare time to get started on my Handmade Christmas! Like many people out there, I'm part of a "blended family" so not only do I have my blood-relatives, I also have a step-family, and now in-laws as well! Not that big of a deal if you're not close with your family, but I am! I'm also very fortunate to have gained sisters over the years... I have one younger brother (who I adore) but I've ALWAYS wanted a sister, especially now that I am older and see my friends' amazing friendships with their sisters. Luckily my husband's sister is totally amazing and she, like me, did not have any sisters growing up. So now I finally have a sister - yippee!!! My husband's brother is also engaged to an amazing woman who I am also proud to call my sister, AND my brother is also dating a fantastic girl who I completely adore. I have been frantically sewing away for all 3 of my sisters and am soooo excited about what I've made for them! I will be posting more about my Handmade Christmas later since I don't want to ruin any surprises! I love Christmas (and I also believe in it as well), but I can't stand the mass-consumerism that is associated with it these days... I like to handmake gifts for friends and family, not only because I can't afford to buy lots of things for people I also find that a handmade gift is much more personal. What sorts of things do you like to do to show people you love them around the holidays?